Successfully Added Bluetooth Smart Watch - IP67 Waterproof, Bluetooth 4.0, Social Notifications, Pedometer, Calories Burned to your Shopping Cart. The EX16 Bluetooth Smart Watch is a great outdoor gadget that comes packed with a wide range of features which makes it great for all sports and outdoor lovers. 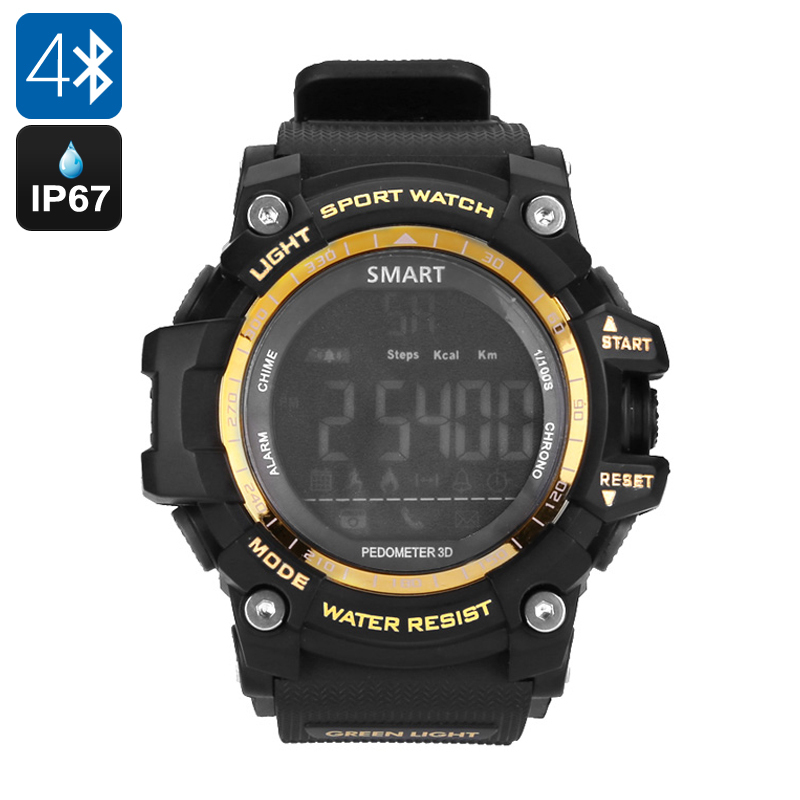 With its IP67 waterproof design, this Bluetooth sports watch can be used in any environment and during the toughest sporting sessions. Resistant against water, dust, and drops – you’ll be able to wear and use this Bluetooth smartwatch virtually anywhere. Whether you’re into hiking, mountain biking, fitness, or running – this beautiful health gadget is sure to meet all your demands. Featuring Bluetooth 4.0 connectivity, this smart watch can be effortlessly paired with both iOS and Android smartphones. Ultra-fast data transactions make sure that you’ll be treated with accurate results, providing you with highly detailed exercise reports on your smartphone while using the dedicated mobile application. Its pedometer allows you to keep track of the distance covered, steps taken, and calories burned throughout all your workout sessions – making sure that you’ll reach your future fitness goals in absolutely no time. On its beautiful 1.1 Inch display, it constantly keeps you updated with the latest exercise data – guaranteeing that you’ll always be able to adjust your workout accordingly. Thanks to its powerful CR2032 battery, this sports watch can be used for a year without needing to worry about running out of juice. When paired with your smartphone, this Bluetooth smartwatch furthermore provides you with useful call and message reminders and social media notifications – guaranteeing that you’ll never miss an important update again. No matter where you’ll be at, with this Bluetooth smart watch you’ll always stay connected and up to date about your friend’s latest activities.